I found myself standing in front of 27 students, my first day as their teacher, the Monday after Thanksgiving. I was brought in as their Spanish teacher to pick up the pieces after their previous teacher ran screaming into the night, unable to deal with the behaviors and diverse academic needs of the 130 students on the rolls. Although it was my 20th year as an educator, it was my first foray back in the classroom following a five-year hiatus. During those five years, I served as a staff developer and director of talent development. Both of those positions had me teaching adults rather than children (which is a culture shock and an article in and of itself). In the latter position, I was a part of the district’s leadership team and responsible for the development of administrators as well as teachers. I wish I could declare that my 38-day romp back in the classroom was born out of an altruistic desire to go back to my roots as a classroom teacher . . . to recapture a lost passion for teaching and children. It was, however, the result of a particularly nasty budget season in the school district in which I worked and, as the last one hired, I was the first one laid off. After having the summer off for the first time in a decade, and a shallow pool of posted school administrator jobs, I decided (and my bank account agreed) to take a teaching position until I found the right leadership job in the right district. I am fortunate in that World Language teachers, especially dual certified world language teachers, with a history of success with urban students, are in short supply. The lessons learned, beliefs confirmed and realities discovered during this time can be categorized into the areas of Leadership, Followership, and Fellowship. In many ways, my leadership philosophy was validated during this return to the classroom. One pillar of my beliefs is that educational leaders need to focus on development in lieu of punishment. This holds true for both pedagogy and andragogy. A fight broke out in a class between a 10th-grade girl and an 11th-grade boy. Being the age of smartphones and the internet, videos were taken and eventually reached the parents of the girl involved. Complaints were made and the teacher was suspended for 3 days (without pay), citing an inability to create a safe environment in the class. Upon return to the classroom following the suspension, for the subsequent five days, there was a rotation of administrators in the room for a couple of hours a day. On the sixth day, and the following 5 days, there was no administrative presence. On day 12, the teacher was told that the district was going to move for termination. No support was given to the teacher during this time to help with classroom management: not in the form of professional learning opportunities, nor providing resources to promote more safety in the class. Most notably, there was never any feedback given to this teacher following the hours of observation conducted by the leaders of the school. It was as though the suspension was, in and of itself, a remedy to whatever deficiency existed in the teacher’s practice. Was the teacher expected to absorb better management techniques through osmosis? Michael Fullan’s article, “Choosing the Wrong Drivers for Whole School Reform” (2011) clearly delineates the danger of a school culture which uses accountability as a driver versus centering on capacity building. The actions taken (or avoided) by the leaders in this building were clearly punitive, without regard for what was best for the students in the room. Fullan’s article is a seminal piece of school reform and school climate literature. It is considered essential learning by most educational leadership programs. Which begs the question: is the leadership unaware of the research; is aware of the research, but dismissive it; or, is unwilling or incapable of seeing the reality of their school’s culture. Every administrator should be required to return to the classroom, with 100 percent responsibility for teaching, learning, and paperwork for the students . . . and must go through the same observation and evaluation process as all teachers in the district. I have had the good fortune of working with amazing school administrators. I have worked under mediocre school administrators. I have seen poor administrators from a distance and as an evaluator. This return to the classroom was my first opportunity to work under poor school administrators. I have a new appreciation for how demoralizing, anxiety-producing, and counterproductive unhealthy leadership can be. I had the opportunity during this time to practice my ‘followership’ skills, which was a poignant experience after serving as a district leader for half a decade. It was time to put my money where my mouth is. I had the opportunity to be the teacher I want those whom I lead to be. As an educational leader, I am most insistent on a student-centered classroom, differentiation at all grade levels and using technology to redefine and redesign teaching and learning. Could I walk the walk? It wasn’t long before my class was humming. Students were engaged in ‘minds-on’ activities, leveled and scaffolded for their strengths. I leaned on the brain research and designed every class around almost a ‘readers’ workshop’ model. I began each class with a mini-lesson, then the students self-assessed and self-grouped according to their level of understanding. This afforded me the opportunity to work with a small group of students who needed re-teaching. Students who were ready to apply the new concepts were off and running with learning activities that required a higher depth of knowledge to complete. Those students who were not yet confident or comfortable with the new material worked together on activities to cement their understanding before moving onto the independent application. This is when my followership collided with the building’s leadership. Some of the leaders in the building would have preferred seeing tidy rows of students taking notes as I droned on and presented the information; to be followed by students completing independent, quiet work at their desks. I was told many times during those 38 short days, “busy hands are quiet hands;” a confusion of ‘hands-on’ versus ‘minds-on’ activities. At that point, my decision was one that so many teachers make, I closed my door and did what is best for kids. I adhere to Robert Kelly’s theory of followership. Teachers should not be obedient automatons; rather, they need to “have the vision to see the forest and the trees, the social capacity to work well with others, the strength of character to flourish without heroic status, the moral and psychological balance to pursue . . . goals, and above all, the desire to participate in a team effort for the accomplishment of some greater common purpose.” (1998, p. 142) Finally, as a leader, I have always encouraged teachers to take a risk, try something new (research-based) and if it turns out to be ineffective (or less effective) that’s ok. We promote a growth mindset among our students and discourage fear failure. We must expect no less from our teachers. Any error made in the name of doing what is best for the students is easily forgivable. It is very difficult to be that ideal follower, when faced with a less than effective leader. No effective educational leader would tolerate a teacher placing the blame for poor academic progress on the students. Nor can we allow ourselves or our colleagues to hold teachers solely responsible for shortfalls in school culture and climate. The search for an answer must begin with an inward look at one’s own leadership practice. French philosopher Jean Paul Sartre famously declared: “Hell is other people.” This is no more true than in a school. Educator and author Rolland S. Barth wrote: “Relationships among educators within a school range from vigorously healthy to dangerously competitive.” He goes on to say that the relationship among the cadre of teachers in a building have a significant impact on student achievement. You can glean a lot about the relationship among teachers in a building by walking down a hallway in the middle of the day. Are the classroom doors open? Are teachers eating lunch at their desks? Do teachers talk to each other in between classes? On bus duty? I have taught in buildings where I hunkered down in my classroom for 7 hours a day, rarely coming up for air, so toxic was the culture. I have also worked in buildings with an open, caring, sharing and personally and professionally supportive environment. Barth categorizes the relationships among teachers in a school as parallel play, adversarial relationships, congenial relationships, or collegial. Clearly collegial relationships are most desirable and most advanced on the relationship spectrum. Although I was teaching in a large school, I found my circle of collegial professionals. We talked shop, shared resources and strategies, commiserated when a lesson bombed, offered sincere and constructive feedback and celebrated when a lesson went well. There can be a distinct connection among a cadre of teachers. We are experts at gallows humor and bond as combat buddies do. Out of frustration or exhaustion, we may occasionally speak unkindly about a student, but heaven help the outsider who does the same. We are fiercely protective of our kids, and of each other. Even in the toughest of times, knowing you are going to be working among a trusted group of similarly-minded people makes getting out of bed, on a cold, dark winter morning easier and worthwhile. In many ways, the role of a teacher changed during my 5-year break. Data-driven decision-making became the expectation. A new teacher evaluation plan was in place statewide. Technology integration came to mean more than using a smartboard as a fancy overhead projector. Personalized professional learning is becoming the norm rather than the exception. Schools have gone from banning mobile devices to realizing they are an essential tool in the learning process. However, the soul of teaching and learning has not and will never change. It is all about relationships and community. As a teacher, I have the power to create a community of learners in my room; where students learn from each other, from me and I from them. As a leader, I have the responsibility to establish an environment in which teachers and students feel heard and empowered. I have the choice to encourage a culture of development and learning, or a punitive culture of regulation. Barth, R. S. (2006). 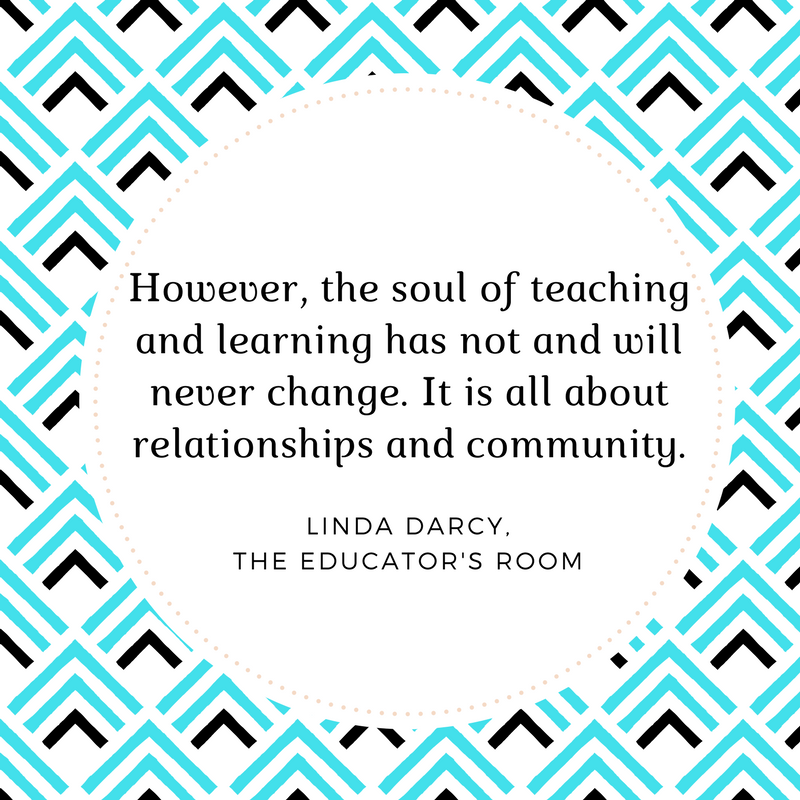 Improving relationships within the schoolhouse. Educational Leadership, 63 (6), 8-13. Fullan, M. (2011). Choosing the wrong drivers for whole system reform. Centre for Strategic Education, Seminar Series Paper, 204. Kelly, Robert (1988). In praise of followers. Harvard Business Review, November, https://hbr.org/1988/11/in-praise-of-followers.